The White Mill, also known as Hovell's Mill was built to replace an earlier mill on the same site, known as the South_Mill. The mill was the southernmost mill on the Denes and was later moved to North Common and known as Greengrass Mill. In 1783 the mill was recorded as having a roundhouse and used common sails to power two pairs of French buhr stones. One pair of 5 ft. stones in the head of the mill and one pair of 4 ft. 6 ins. stones in the tail of the mill along with a boulting mill. At this time a three storey horse mill with a 20 foot wheel was being operated adjacent to the mill house. By 1822 the mill was recorded as using four double shuttered patent sails and was turned to wind by a six bladed fantail on a tailpole. Along with the two pairs of French buhr stones, the mill also had two flour mills and a jumper. The roundhouse had two floors and the mill buck had three floors. In 1770 James Ransome obtained permission to erect posts and rails around his mill in return of making a payment of 6d per annum in order to install a self winding fantail..
A DWELLING HOUSE situate on Yarmouth Denes late in the occupation of Samuel MASON, consisting of . . .
Also a Horse Mill adjoining the Dwelling house with a 20 Feet Wheel, three Floors and two full sized Boulting Mills, a Stable for 4 Horses and Hay loft over the same and several convenient Outhouses. These Premises are held by Lease from the Corporation of Great Yarmouth for 40 years, 32 of which will be unexpired at Michaelmas next, subject to the Rent of £4.10s. per annum. 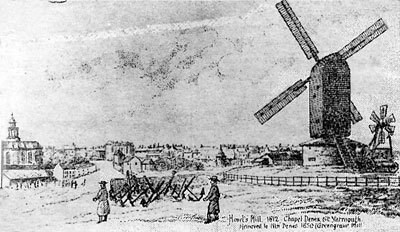 A Freehold POST WINDMILL situate on Yarmouth Denes, late in the Occupation of the said Samuel MASON, consisting of a Brick round House and 4 floors with two Pair of Stones; the Head Stones five Feet and the Tail Stones 4 Feet 6 Inches, with one Boulting Mill, two Suits of Sails and going Geers complete. Freehold Tenement . . .
All the above Premises are in exceeding good repair. For further Particulars apply to Richard BUSH, Merchant, London, Mr. John PALMER, Merchant, Great Yarmouth, the Assignees or Messrs. PITCHES & LUARD, Solicitors, Sithins Lane, London or Mr. James SAYERS & Mr. William STEWEARD, Attornies, Great Yarmouth. All Persons indebited to the Estate of Samuel MASON & Robert WOODS of Great Yarmouth in the county of Norfolk, Bankers & Co-Partners, Bankrupts, or to the separate Estate of the said Robert WOODS, are hereby required to pay their respective Debts to Mr. Richard BUSH, Merchant, in London, William FISHER, Esq. & Mr. Samuel BARKER of Yarmouth, the Assignees or to Mr. REYNOLDS or Mr. CLOWES, Attornies in Yarmouth. The Creditors of Samuel MASON of Great Yarmouth in the county of Norfolk, Corn Chandler, are required to meet at the Angel Inn at Great Yarmouth aforesaid on Saturday 13th Day of November next, at 12 o'c noon . . . to make a final Dividend . . .
A PAIR of good FRENCH STONES 4 ft. 7 ins. Diameter with Irons complete. Also Horses etc. and various articles used in the milling trade . . .
. . . demands on Estate & Effects of Thomas Hovell . . . to send accounts to Mr. William YOUELL, of Great Yarmouth, merchant. A Capital Messuage situate on Yarmouth Denes late the residence of Mr. James HOVELL deceased, with greenhouse, garden, spacious granaries, horse mill, 4-stalled stable, hay house, chaise house, cart shed and other convenient outbuildings, the scite of which buildings, with the ground thereto belonging contains in length from east to west 41 yards, on the north side and 64 yards on the south side, 80 yards on the east side and 93 yards on the west side. the Messuage contains . . .
Also an excellent Windmill containing five floors, with patent sails, standing on a brick roundhouse, with two pair of French stones (one pair 5 ft. and the other 4 ft. and a half in diameter) and two Flour Mills. Also a Cottage, brick & tiles, contiguous to the Mill. The Messuage and Land are holden by Lease from the Corporation of Great Yarmouth for a term of which 44 years were unexpired at Michaelmas last and the Mill and Cottage are Freehold. The above Premises are in complete repair, within a short distance of the Town and are calculated for the carrying on of an extensive business in the Corn Trade. Immediate Possession of the House and Land will be given and it is expected that the Purchaser may also obtain early Possession of the Windmill and Cottage. The House and Mill may be viewed on application to Mrs. HOVELL on the premises. Apply (if by letter post paid) to Messrs. COCKELL & SPANTON, Solrs. Attleburgh. A Capital FREEHOLD WINDMILL situate on the Denes in Great Yarmouth aforesaid, know by the name White Mill, containing five floors, with patent sails, pair of French stones (one pair 5 ft. and the other 4 ft. and a half in diameter) and two Flour Mills and standing on a nearly new substantial brick roundhouse. Also a Freehold brick & tiled Cottage, contiguous to the Mill. The above Mill and Premises are in capital repair and Possession may be had at Michaelmas next. To view the same apply to Mr. Purdy the Tenant. Further particulars on application to Mr. John BEART, Solr. Great Yarmouth, if by latter post paid. A Very Excellent WINDMILL in good repair, with large Roundhouse, most advantageously situated for trade on the Denes of Great Yarmouth and where a large milling trade has been carried on for many years. Apply to TOLVER & PRESTON, Solr. Great Yarmouth. All that large sized Old Established and well built Freehold POST WINDMILL, Cottages and Stables (late HOVELL'S) situate on the Denes, Great Yarmouth opposite the Theatre Gates. The Mill has an excellent Roundhouse, is well fitted up and is not subject to any Outgoings except Land Tax and there are good roads to her. Particulars of Mr. SAYERS, Solr. or to Mr. PETTINGILL, Auctioneer, Great Yarmouth. A Capital Freehold POST WINDMILL driving two pair of Stones with Brick Roundhouse, small Dwelling house, Stable, Cart Lodge etc. situate on the Denes, near the Theatre Gates, Yarmouth. The above described Post Wind Mill with all her going Gear etc. Apply to Mr. PETTINGILL, Auctioneer, Yarmouth. A Substantial FREEHOLD POST WINDMILL with Brick Roundhouse, Winding Apparatus, cast iron Shaft and patent Sails, driving two pairs of French Burr Stones, Flour Mill and Going Gear complete. Cottage . . . Stable, Gig house and large Piece of Ground well fenced in, situate on the Denes in Great Yarmouth and now in the occupation of Mr. James Last. Large repairs have lately been made on the Property which is in every respect in good order and condition and an extensive Retail Trade appertains to it. Outgoings Land Tax £1. 19s. 2d. Apply to Messrs. TOLVER & PRESTON, Solrs. or the Auctioneer, Great Yarmouth. A Substantial POST WINDMILL now standing on the Denes in Great Yarmouth and lately occupied by Mr. LAST, with Winding Apparatus, Iron Shaft, Patent Sails, two pair of French Burr Stones, Flour Mill, Jumper, Straps and going Gear complete. The Mill has been lately extensively repaired and the Iron Shaft, Brasses and Straps are new and of the best quality. Apply to Messrs. PETTINGILL or to Messrs. TOLVER & PRESTON, Solrs. Yarmouth. No mention of Mill in October Rates, though values the same as in June. Presume - Mill not valued in June as not in use but awaiting sale and removal. In October mill had been removed and was being re-erected on North Denes as later "Greengrass Mill". A road branching off from Regent Road near the Theatre Gate and extending eastward formerly called East Hill Road and now named Albion Road forms a junction with Apsley Road. Another road also branching off from Regent Road near Theatre Gate extended still further to the south towards a mill called 'HOVELL'S MILL' now demolished . . . It is now called Crown Road. 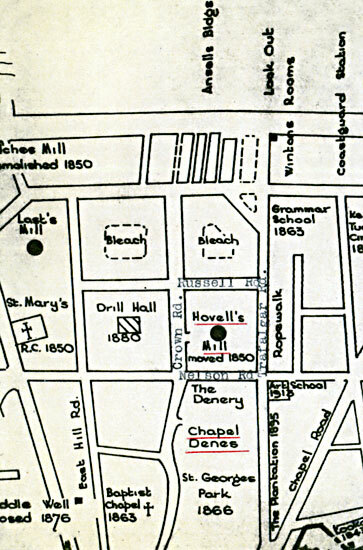 The open space between Trafalgar Road and Crown Road, long known as the Chapel or St. George's Denes, was in 1866 . . . enclosed and planted at the expense of the Town Council. This park . . . is bounded on the east side by the house and grounds of Isaac Preston, EAS. Adjoining this modern house is an older one of red brick, which was formerly the miller's house, attached to the mill already mentioned, which stood a little further to the east, on the other side of what is now Nelson Road. Mr James Hovell, miller who inhabited this house for many years died in 1822. His widow died in 1829. In 1835 it belonged to George Gabriel Bell, then later 1742 to Edmund Freeman and at its removal to the North Denes in 1850 to HOVELL the miller. . . it's close proximity to St' George's Chapel. N.B. James Hovell died in 1822, so the 1850 incumbent was probably William Beevor.